Unter Bezugnahme auf die jüngste Debatte über Günter Grass‘ Gedicht „Was gesagt werden muβ“ erlaube ich mir festzustellen, daβ Herr Grass den Nobelpreis für Literatur des Jahres 1999 aufgrund literarischer Verdienste, und ausschlieβlich aufgrund literarischer Verdienste, erhalten hat – was, nebenbei gesagt, für alle Preisträger gilt. Die Schwedische Akademie sieht heute wie zukünftig keinen Anlaβ für eine Diskussion, ihm diesen Preis in irgendeiner Weise streitig zu machen. Die Art und Weise des Erstschlags wird nicht konkretisiert, und aus dem konjunktivischen ›könnte‹, das auf die möglichen Konsequenzen eines heillos eskalierenden Militärschlags gegen iranische Atomanlagen verweist, wird mutwillig ein entsprechender Wunsch der israelischen Regierung gebastelt. Das ist intellektuell unredlich – aber mit Intellekt hat die allseitige Schmähkampagne gegen Günter Grass ja auch nichts zu tun. Grass mache das Opfer zum Täter, heißt es. Iran sei der Aggressor, die Drohungen Ahmadinejads, Israel von der Landkarte zu wischen, seien mehr als bloßes Maulheldentum, Grass verkenne die wahre Situation, er spreche Israel das Recht auf Selbstverteidigung ab, ja, er bestreite geradezu das Existenzrecht Israels. Solchen Anwürfen kann man nur mit einem Faktencheck begegnen. Kein Satz wird so häufig mit dem amtierenden Präsidenten Irans, Mahmud Ahmadinedschad, assoziiert wie dieser: Israel muss von der Landkarte radiert werden. Das Problem ist nur – er hat diesen Satz nie gesagt. Wie ernst ist die Gefahr eines israelischen Erstschlags gegen die Atomanlagen im Iran? Glaubt man Anshel Pfeffer, der bei der ›Haaretz‹ den ›the-axis-haaretz-iran-blog‹ betreibt, hat Netanjahu Anfang März gegenüber Obama abgelehnt, mit dem Militärschlag bis nach den amerikanischen Wahlen im November 2012 zu warten, sondern lediglich versprochen, bis zum Herbst dieses Jahres abzuwarten, so daß der Angriff in die letzte Zeit des Wahlkampfs des amerikanischen Präsidenten fallen und diesen unter Druck setzen würde. So könnte Israel Konzessionen der USA gegen das Versprechen erzielen, den riskanten Militärschlag zu unterlassen. If recent reports of a Netanyahu promise to postpone an attack on Iran until the fall are true, a possible strike would correspond with the pivotal weeks just before the American presidential election. Since most military analysts believe that Israel would almost certainly prefer to carry out a complex and difficult long-range attack on Iran in a period when the skies above the target are cloudless, that either means Israel has agreed to postpone the potential strike for at least another eleven months or that the window of opportunity is open now for September or October. In other words, during the crucial final stages of the American presidential elections campaign. We have no way of verifying this report but it does tally with what Barack Obama said two months ago – „I don’t think that Israel has made a decision on what they need to do.“ And of course, it fits in with Netanyahu’s tendency to play the internal American political arena. Announcing that Israel may decide to attack Iran at the worst possible political timing puts pressure on Obama, and could potentially lead to some valuable American concessions to Israel, in exchange for an eventual commitment not to strike. U.S. officials say Iran’s leaders are gathering the materials for a nuclear bomb but have not decided to build one. If they do, they’l have to overcome technical hurdles and risk having their work discovered by outsiders. Here are steps Iran might follow to make its first weapon. “There was never even a ripple,” said a former senior U.S. intelligence official involved in the previously undisclosed mission. CIA stealth drones scoured dozens of sites throughout Iran, making hundreds of passes over suspicious facilities, before a version of the RQ-170 crashed inside Iran’s borders in December. The surveillance has been part of what current and former U.S. officials describe as an intelligence surge that is aimed at Iran’s nuclear program and that has been gaining momentum since the final years of George W. Bush’s administration. The Obama administration has cited new intelligence reports in arguing against a preemptive military strike by Israel against Iranian nuclear facilities. Israeli officials have pushed for a more aggressive response to Iran’s nuclear activities, arguing that Iran is nearing what some officials have called a “zone of immunity,” in which Iran can quickly complete the final steps toward becoming a nuclear power inside heavily fortified bunkers protected from Israeli airstrikes. Israel ist auch für die USA aus dem Ruder gelaufen: also wird jetzt offenbart, daß der Iran ab jetzt noch ein Jahr bis zur Waffenentwicklung brauchen würde, wenn er sich denn wenigstens jetzt zu einen solchem Programm entschlösse. Netanjahu geht allerdings von einem halben Jahr aus – daher die Ankündigung eines Abwartens nur bis September/Oktober. On the tail of the long report, there was a very interesting detail – that despite the capture of one of the U.S.’s ultra-secret RQ-170 surveillance drones that fell in Iran four months ago and was displayed on Iranian television, the „Beast of Kandahar“ is still silently overflying Iran, escaping radar detection. Wer also gefährdet aktuell den Weltfrieden: Israel oder Iran? Und wie gefährlich ist die Atommacht Israel? In this situation, he went on, more and more Israelis were coming to regard the ‚transfer‘ of the Palestinians as the only salvation; resort to it was growing ‚more probable‘ with each passing day. Sharon ‚wants to escalate the conflict and knows that nothing else will succeed‘. Es ging noch einmal gut: aber daß diese Phantasien bei Regierungen bestehen und sie auch noch die Mittel dazu haben, sie umzusetzen, sollte ausreichen, um eine kritische Haltung gegenüber dem einzunehmen, was jetzt gerade geschieht. 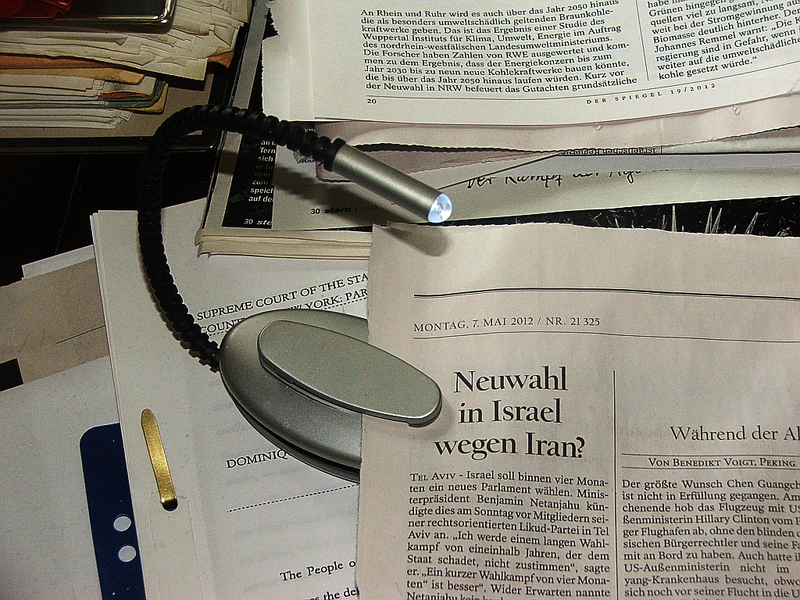 Bereits im April 2006 warnte Martin van Creveld Israel davor, den Iran anzugreifen. Unter den gegebenen Machtverhältnissen stelle ein nuklear bewaffneter Iran keine Bedrohung für die USA dar und, allen Brandreden Ahmadinejads zum Trotz, nicht einmal für Israel. Israel habe schon seit langem ausreichendes Abschreckungspotential. Und er weist schon 2006 darauf hin, daß den Geheimdiensten der Bush-Administration nicht zu trauen ist, was die angebliche Nuklear-Rüstung Irans angeht. Seit fünfzehn Jahren erzählen sie, daß der Iran in drei oder fünf Jahren die Bombe haben werde. Published April 21, 2006, issue of April 21, 2006. Given the balance of forces, it cannot be argued that a nuclear Iran will threaten the United States. Iranian President Mahmoud Ahmadinejad’s fulminations to the contrary, the Islamic Republic will not even be a threat to Israel. The latter has long had what it needs to deter an Iranian attack. Should deterrence fail, Jerusalem can quickly turn Tehran into a radioactive desert — a fact of which Iranians are fully aware. Iran’s other neighbors, such as Russia, Pakistan and India, can look after themselves. As it is, they seem much less alarmed by developments in Iran than they do by those thousands of miles away in Washington. The main countries to feel the impact of a nuclear Iran will surely be those of the Persian Gulf. This is not because Tehran is likely to drop a bomb on Kuwait or the United Arab Emirates; rather, the Iranian regime may feel less constrained in dealing with its neighbors across the Gulf. Last but not least, before deciding to bomb Iran’s nuclear installations the Bush administration must seriously question whether the intelligence on which its decision is based is reliable. Those of us who have followed reports on the development of Iran’s nuclear program know that the warnings from American and other intelligence agencies about Tehran building a bomb in three and five years have been made again and again — for more than 15 years. For 15 years, the intelligence agencies have been proven dead wrong. And to this gross exaggeration of Iran’s true intentions and capabilities must be added the fairy tales the same intelligence agencies have been feeding the world regarding Saddam Hussein’s alleged weapons of mass destruction. The Central Intelligence Agency, Defense Intelligence Agency, National Security Agency and the rest of the American intelligence community may know where Iran’s nuclear installations are located. Or they may not. They may know how those installations are inter-connected, which ones are the most important, and how they can be hit and destroyed. Or they may not. If their past record is any indication, the intelligence agencies may not even know how to tell whether they know enough about Iran’s nuclear installations — or whether or not they are lying to their superiors, or to themselves. Anybody who believes one word they are saying — let alone uses the “information” they provide as a basis for decision-making — must be out of his or her mind. »Die meisten geistig gesunden Menschen – eingeschlossen die in Israel – verstehen, daß ein unprovozierter israelischer Angriff auf den Iran katastrophale Auswirkungen haben könnte. Er würde die Bewegung des Arabischen Frühlings in eine entschiedene anti-westliche Richtung befördern, die Islamisten und die Säkularisten in erneutem verstärkten Haß gegen Israel vereinen und eine Serie von terroristischen Attentaten sowohl in Israel als auch auf westliche Einrichtungen in arabischen Ländern mit schiitischer Bevölkerung hervorrufen. CAMBRIDGE – Israel is daily ratcheting up its threats to attack Iran over its nuclear program. Unfortunately, these threats have come to overshadow more pressing events in Syria, which is the epicenter of a regional crisis that will determine the future of the Arab Spring, as well as Iran’s role in the Middle East. The Israeli government has vastly exaggerated the threat that a nuclear Iran poses to its security, as well as Israel’s capacity to halt it. Disabling the Iranian nuclear program by aerial bombardment is probably impossible, owing to its size and dispersion, a lack of actionable intelligence, and, above all, the fact that the element of surprise has long been lost. Iran’s acquisition of the bomb, on the other hand, could bring increased stability to the region, as the doctrine of Mutual Assured Destruction demonstrated in the Cold War between the United States and the Soviet Union. Understood in this light, the real threat is not Iran’s pursuit of a nuclear weapon, but Israel’s attempts to halt it, which would surely incur Iranian retaliation through blockade of the Strait of Hormuz – sending oil prices soaring to more than $200 a barrel and driving the world’s major economies into sustained free-fall. In fact, despite the faux solidarity that US President Barack Obama expressed to the American Israel Public Affairs Committee in early March, Israel’s saber-rattling appears to be galvanizing an American modus vivendi with Iran in order to avert an Israeli attack. This reading of events is amplified by British Prime Minister David Cameron’s statements during his recent US visit. The subtext is that Cameron and Obama have closed ranks in identifying Israeli Prime Minister Binyamin Netanyahu, and not the ayatollahs, as the primary wildcard. Netanyahu threatens to upend Obama’s carefully constructed international consensus concerning sanctions and containment of Iran – a consensus that averts regional mayhem. Most sane people – including in Israel – grasp that an unprovoked Israeli attack on Iran could have catastrophic consequences. It would push the Arab Spring movements in a decidedly anti-Western direction, unify Islamists and secularists in a reinvigorated hatred of Israel, and provoke a spate of terror attacks both inside Israel and on Western interests in Arab countries with Shia populations. Acknowledging the virtual Armageddon that could follow from an ill-conceived attack on Iran is not appeasement. It is simply recognition of the reality that Israel and the West have little to fear from Iran – even an Iran with limited nuclear capacity. Sollte die iranische Bedrohung, wie zahlreiche israelische Politiker sie beschreiben, existenzieller Natur sein, dann muss man einen militärischen Eingriff mit allen damit verbundenen Nachteilen ernsthaft in Erwägung ziehen. Ich bin nicht der Auffassung, dass die Bedrohung existenziell ist. Daher glaube ich, dass wir uns völlig anders mit dem Problem auseinandersetzen müssen. In einem Punkt bin ich mir sicher: Die Folgen eines militärischen Alleingangs Israels hätten unvorstellbare Konsequenzen für unser Land. Daher sollte von der militärischen Option Abstand genommen werden. Die zweite Option besteht darin, zu lernen, mit der Bombe zu leben. Wenn ein Staat entschlossen ist, nukleare Waffen zu besitzen, wird es ihm über kurz oder lang auch gelingen (siehe Pakistan). Man kann das iranische Programm militärisch nicht ein für alle Mal ausschalten. Aber sollte man sich deshalb darauf einstellen, regelmäßig aufs Neue militärisch vorzugehen? Mit der iranischen Bombe zu leben würde für Israel, die Region und den Westen einen Paradigmenwechsel bedeuten. Israel würde sich einige grundsätzliche Fragen bezüglich seiner zukünftigen Abschreckungsstrategie stellen und Antworten darauf finden müssen, wie es sich auf die neue Lage einstellt. Ebenso müssten die USA und die Nato überlegen, welche Strategie sie dann in der Region verfolgen wollen. Die Anpassung würde nicht leicht sein. Hoffen wir deshalb, dass die Vernunft obsiegt und die Welt es schafft, Iran endlich unmissverständlich den Ernst der Lage klarzumachen. Warum ist es so schwierig, sich von einem überholten Konzept der militärischen Überlegenheit zu verabschieden, wenn sich ein Gleichgewicht des Schreckens doch wesentlich stabilisierender auswirkt? Grass hat mit seinem Gedicht die wahre Sachlage erfaßt – und viele scheinen es ja geflissentlich übersehen zu haben, daß sein Hauptgegner die deutsche Politik ist. Da gesteht der Verteidigungsminister gegenüber BILD, daß er seinem israelischen Kollegen von einem Angriff auf den Iran wegen der nicht beherrschbaren Konsequenzen abgeraten habe. Warum stellt er sich nicht vor das Parlament und erklärt, welche Planspiele in seinem Haus und beim BND zu diesem Szenario durchgeführt wurden? Wieso gibt er nicht bekannt, wie die militärischen Optionen Deutschlands im Kriegsfall aussehen? Und warum begründet er nicht, wie er den Rechtsbruch verantwortet, Waffen in ein Spannungsgebiet zu verkaufen und die Lieferung auch noch mit 135 Mio. Euro zu subventionieren, auf daß die deutsche Rüstungsindustrie gedeihe? Warum erklärt Frau Merkel nicht, wie sie die Staatsdoktrin der deutschen Garantie der Sicherheit Israels in der aktuellen Lage – gegen Obama – umzusetzen gedenkt? Warum müssen israelische Gast-Autoren in deutschen Zeitungen für die Freiheit der Meinung und der Kunst des widerlich gebashten Günter Grass streiten, warum schweigt unser Freiheitskämpfer und Herzens-Präsident Gauck, jetzt, wo es mit billigen Predigten nicht mehr getan, sondern wirklich mal Mut gefragt ist? Weil er nur von Springers Gnaden Präsident geworden ist? M.Z. : Ja, es handelt sich in der Tat um Vergleiche, die das, was ein Adorno noch als unsäglich apostrophierte und sich davor scheute, allzu schnell mit Namen zu benennen, in einen polemisch konstruierten Zusammenhang bringen. Es geht also um eine verbale Praxis, die letztlich darauf hinauslaufen muss, dass durch Inflationierung des Begriffs, mithin durch seine Abnutzung die welthistorische Singularität der Shoah, aber eben auch das Bewusstsein von den geschichtlich gewichtigen Auswirkungen des realen Antisemitismus schlicht aushöhlt. Was den Polemikern, die solche Vergleiche in Israel wie in Deutschland anstellen, entgeht, ist die Tatsache, dass sie damit nicht nur die historischen Opfer des Antisemitismus für unhaltbare Zwecke instrumentalisieren, sondern dass sie die Opfer im Stande ihres Opferseins, also als die, die sie waren, nämlich Opfer, nicht mehr erinnern. Damit verraten sie die Opfer selbst, aber auch das Andenken daran, was diese zivilisatorisch repräsentieren – eine Opfer erzeugende gesellschaftliche Realität – ein weiteres Mal. Im Falle der so agierenden Deutschen wundert mich das auch gar nicht: ihnen geht es ja gar nicht um die Juden, schon gar nicht um die heute noch lebenden, sondern primär um ihre eigene Befindlichkeit bzw. um die Regulierung ihres gestörten emotionalen Haushaltes. Es handelt sich um ein regressives Moment. Im übrigen hat Deutschland keinen Anlaß, sich über das Einreiseverbot Israels aufzuregen. Mit der Meinungs- und Wissensschaftsfreiheit ist es eben auch in einem demokratischen Rechtsstaat so eine Sache, wenn man gegen die geltende Staatsdoktrin verstößt. Eigentlich sollte auch der Mißbrauch des Holocaust dazu gehören, wie ihn Netanjahu Anfang März in den USA betrieb. Kritik daran war aber nur aus Israel zu hören. FOCUS Online:Netanjahu hat Obama auch Aufzeichnungen des US-Außenministeriums übergeben, die 1944 erstellt wurden und aus denen hervorgeht, dass trotz Bitten von jüdischen, polnischen und anderen Exilanten das KZ Ausschwitz nicht verhindert wurde. Brock: Es gab nur sechs Eisenbahngleise nach Auschwitz. Wenn diese gesprengt worden wären, hätte es Auschwitz nie geben können. Roosevelt, Stalin und Churchill haben das systematische Töten von Juden trotz klarer Beweise nicht unterbunden. Sie hätten diese Gleise sprengen können, doch sie haben es nicht getan. Netanjahu gibt Obama damit zu verstehen, dass die Amerikaner damals den Holocaust nicht verhindert haben und sich damit mitschuldig gemacht haben. Hier stecken also die großen Dimensionen in diesem Fall und die hätte ein Grass erkennen müssen. Doch mit seinen Zeilen ist er in der Widersinnigkeit geendet. FOCUS Online: Auf welche aktuellen Ereignisse spielte Netanjahu mit dieser Botschaft an? Brock: Die klare Botschaft, die hier überbracht wird, ist, dass es eine solche Situation wie Auschwitz nie weder geben darf. Damit wird eine neue Dimension eröffnet, weil Netanjahu klar sagt, dass auch die Amerikaner Schuld am Holocaust haben. Netanjahus Botschaft ist klar: Amerika muss den Präventivschlag mit Israel gegen den Iran führen oder glaubhaft versichern, dass die Iraner keine Atombombe bauen. Doch mit diplomatischen Mitteln wird das nicht funktionieren. Das funktionierte schon in Indien, Pakistan und Nordkorea nicht. Deshalb wird es auch nicht im Iran funktionieren. Und der Iran hat als erklärtes Ziel die Vernichtung von Israel. Deshalb gibt es von Netanjahu eine klare Botschaft an die amerikanischen Freunde. Von einem selbsternannten Generalisten kann man keinen Durchblick verlangen. Von anderen schon.